Nebraska, the first film Alexander Payne has made as a director that he did not write, or co-write, is a step away from the acceptance despite damnation history that marked an Alexander Payne film right up until The Descendants, even if it still deals with unlikable characters. Nebraska speaks more to the layers, that old onion thing, and the ways that the surface, particularly one of bitterness often manages to belie what lies beneath especially if the depth is a slowly smouldering pile of charcoal embers, kept in check by years of alcohol abuse now at the edge of going out forever. Probably more than any other of his films, Nebraska‘s character study of the four members of Woody Grants nuclear family is a slow burn that comes to a very bright blaze, making the film a real masterpiece of character development and an extraordinary examination of the depth that layers of weighted years produces. However, equally more than any other film, the unlikable rabble Payne loves to shroud his characters in are worse, deepening the accusations of misanthropy that dog Payne throughout his career. In Nebraska particularly the satellite characters are horrible people, and considering Payne has nailed them all unapologetically to a particular geography, one gets the feeling in Payne’s Nebraska alcoholism becomes the refuge of the saint. Nebraska teeters on a fine line of authenticity because of the overt unpleasantness of the ancillary characters that if it falls too far in a certain direction, plunges the film into a melodramatic grasp at sentimentality strangely pulling away the authentic feel of the four central characters. The point of Nebraska is to see Woody (Bruce Dern), David (Will Forte), Kate (June Squibb) and Ross (Bob Odenkirk) as more than the sum of their parts, to contextualize the human creature inside their experience and move perspective beyond the individuals to a broader commentary on America and its passion for lottery winnings in a post Rand-gasmic capitalism. Sideways was able to achieve this, leaving the audience with an impression of the uselessness of the empty gestures of masculinity, among other things, the final commentary being so much larger than Miles and Jack as characters, however Sideways didn’t posit its two male leads against a bunch of horrible side characters as Payne had done with his earlier films, and the audience were left to focus on the gentle subtleties of the characterisations Payne draws from his casts. Unlike The Descendants, where motivations are too often absent, a crucial moment occurs in Nebraska in a battle with extended family when the internal judgements between the parents and their sons drop away as they band together to defend their obviously ailing father. It’s something unseen in a Payne film before, a crucial moment of alteration when everything before is now judged by everything after, and the family come together under the fabulous performance of June Squibb who leads the charge of defense for a man she has been deriding throughout the first half of the film. The power of this transitional moment is perfectly captured with Payne’s labyrinthine subtleties laced throughout his character arcs so perfectly, that it only takes these few comments to transform every conversation the family have had prior. And yet, as the scenes where the family watch television in unison and the audience gaze out at them from the screen, the enormity of this achievement is whitewashed with a corresponding disdain that surely moves beyond the possibility of real. I have never been to Nebraska, not even to drive through, but I suspect with great conviction there are nice, kind people who live there, and if I am ever fortunate enough to go, I’ll make sure I go when Alexander Payne is not my guide. His Nebraskans aren’t just mean, they’re also stupid, their foolishness used not only as comic effect but as antagonistic mind sets that serve to highlight the depth of the primary families emotional intellect. Just as Payne develops the parents and their two sons relationship with an understated hand, so he overplay’s the embarrassingly stupid ugliness of those around them. I have read that Payne gets Nebraska just right, but again, I am assuming this is in those lovely images of the extended family watching television, or the fantastic bar scenes. It’s when these people open their mouths that Payne betrays them, and as a consequence, his audience with the corresponding watering down the primary character narratives inevitably receive. It is impossible that Woody, Kate, David and Ross are this special when where they come from everyone is so unspecial. A brief word about the performances, because Alexander Payne directs people so well, and despite my misgivings about the weird horrible ‘others’ his treatment of the three primary characters is lovely and a great pleasure to watch. Bruce Dern is a return to form for Payne, instantly capturing that clever way Payne has of internalizing a characters psychic trauma and allowing it to come out in the bodies subtle gesture. It’s a true pleasure to watch it again, and Bruce Dern is understated and spot on in his interpretation of Payne’s direction. Will Forte is charming and sweet as the rather hopeless David, perhaps not quite as developed as he might have been, but Payne never puts two of these enormous performances in the same film, so he’s given it all to Dern here. Still, as a mirror, Forte is a perfect partner for Dern’s huge role, and the two have a heartwarming screen presence. June Squibb is as good as everyone says – it’s the second time she has played a Payne woman, but he was good to her last time, so I can understand her being willing to give it another go, and it pays off well. There’s no comatose or dead woman attacks (thank god) and even if Squibb’s lines have to be delivered (rather strangely) at precisely the same pitch and tone each time, she does get some of the best in the film, and the crucial character changing scene alluded to above is on her shoulders and she carries it well, clearly having a wonderful time with this colourful role. There is a lot of good stuff that happens in Nebraska, and a lot to laugh at and a lot to feel good about, despite its flaws. Definitely a very welcome return to form after the weirdness of The Descendants. The performances are good in Nebraska, but I don’t see it as a return to form for Payne. The characters and scenes didn’t linger in my mind afterwards. I couldn’t laugh at it, as I did with his previous work, maybe because it aimed for realism and was bleaker. So for me, despite 6 Academy Award nominations, it’s a minor film in Alexander Payne’s filmography. I probably need to rewatch it. The film does have something to say about the America dream and the malaise of the finiancial crisis, how Woody Grant’s trip inspires joy in his family/the community, at a time when they need it. I think the romance of the Jim Taylor days are well and truly over – AP just hasn’t been as funny since then. 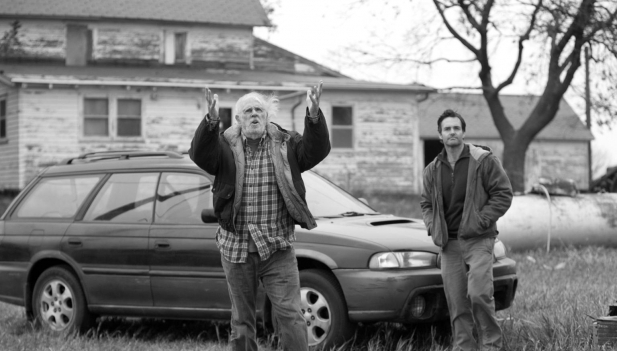 Nebraska is the first film where I got that sense that a lot of people have been saying for a long time, that AP thinks he’s so much better than his characters. I just saw moralising before, but in Nebraska he does come accross as superior to his characters. He was protected in the past (I think) by that fantastic team he had around him. But all that aside, Nebraska had some things about it that show Payne getting better at what he does without his team of super friends – and I think the character development is strong. That’s why I liked it. I hated the cinematography. I’ve never seen a film that needed to be black and white less. But I do think Bruce Dern is the zenith of a progression that starts with Jack Nicholson, works through Paul Giamatti and arrives at Bruce Dern. But you’re right that those halcyon days are long gone, and my fav is still Election. If I may, in your critique of Payne’s portrayal of the (bad/stupid) people of Nebraska you are neglecting the many good folk that have wished Woody a well-spent cash prize without ever hinting that they wanted a cut (including the nice old man that greets him in the bus stop and later when he drives the car), the ever-so-kind reporter/ex-girlfriend and of course the friendly couple that got their compressor accidentally stolen. There were good people in Nebraska. It makes sense to focus on the bad/stupid ones to amplify the antithesis between them and the main cast but Woody’s family are not the exception, they’re merely a minority. In my viewing, when Woody drives through the town in the truck at the end, the shock on the reporter/ex-girlfriends face was a jolt for me, and re contextualized her earlier warmth as patronizing. The camera dwells on her shock at Woody’s success, implying he DID have something to prove to her all along. I had an experience of irritation that she had to be changed by that scene when I first saw the film. The nice old man scene didn’t hit me as hard, so you may be right there, but I really felt the warmth of the ex-girlfriend was stolen away. The Compressor couple (so funny that scene) are lovely, but they don’t know anything about Woody’s journey and therefore have none of the motivator for unpleasantness that the others have. However, your point is well made – and I thank you again for such a great comment.